The problem with being a self-described “cookbook cook” is that it takes a little more oomph for me to step outside the assurance of my books and just create a recipe. The other night, while making Black Bean Tostadas (recipe coming soon), I started imagining a good hearty rice dish as a side. I almost started to go through the tedium of looking up “rice” in my cookbooks when I realized I had a very clear idea of what I wanted, why not just make it? So I did. And as with most things I have made without a recipe, I was very pleased with how it turned out. (Note to self: cook more often without a recipe.) I included some of my favorite flavors in here but, of course, this dish is infinitely adaptable. I happen to love the slight punch and tang of canned green chiles, but if you like more spice, by all means add a fresh jalapeño or two. I used queso fresco partly because I also needed it for the tostadas, but partly because I love how mild it is. But you could certainly use Cheddar or Monterey Jack. Like more cheese? Add more and sprinkle some over the top before baking. A rice note. Unless I am making risotto or something where I specifically want brown rice (or if I am using sushi rice for this dish), I almost always use basmati rice. I think it fluffs up beautifully and has terrific flavor. Trader Joe’s has nice big (and affordable) bags of it. Heat a medium saucepan over medium heat. (I used a 3 quart.) Add just enough oil to coat the bottom, then add the onion and a healthy pinch of salt. Sauté until softened, then add the garlic. Cook for another 3 minutes, then add the oregano. Sauté for another minute. Add the rice and toss to coat with the fat and herbs, then pour in the water or stock. Bring to a boil, then turn the heat down to low, cover and cook for 20 minutes. Preheat oven to 400ºF. Oil an 8×8 baking dish. Once the rice is done cooking, allow it to sit, off the heat, for 5 minutes. Remove the lid and, using a fork, carefully fluff the rice. 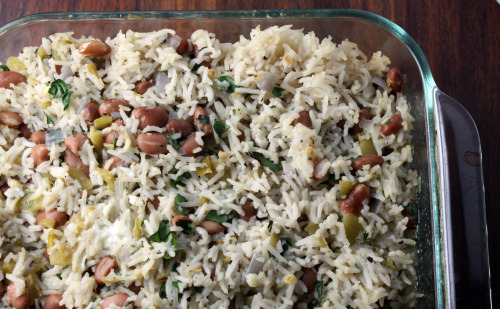 Add the chiles and the beans and, without mushing the rice, carefully stir them in. Sprinkle on the cheese and cilantro and stir them in. Scrape the rice mixture into the prepared pan, cover with foil, then bake until the cheese is starting to melt and the dish is hot throughout, about 20 minutes. Remove the foil and allow to sit for 5 minutes before serving. This looks great. We’re making the transition to vegetarian in our household now, so I am in search of hearty dishes like this one. Going to do a big scan of your recipe index today. How are you? If you’re going to be in the Bay Area anytime soon, drop a line! I’m signed up for BlogHer Food in the fall. You coming down again? I am the worst at coming up with my own recipes. Okay. Not the worst. But my confidence in myself, er, not so much. Participating in recipe contests recently has really helped with that. This looks and sounds delicious. All that cheesy rice goodness. Mmmm. Anytime you want to experiment – you are welcome in my kitchen. oooh! i think mr. coops is gonna LOVE this. Anything rice and bean related and he’s soo there. Thanks for this inspiration. Gonna make soon and report back! I happened to stop by when she was making this and it smelled absolutely incredible. A must cook. This rice looks and sounds lovely so I agree that you should continue to experiment. Great side dish! This would work for a main dish for me! YUM! What a yummy little dish you created!!! Ditch those cookbooks! I seriously bookmark just about every single one of your recipes. Especially the Mexican ones, I love veggie-Mexican meals! 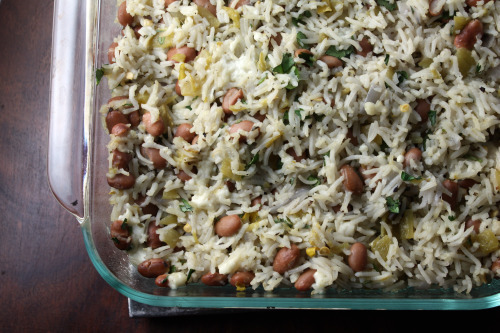 I am a Mexican-cuisine lover and I also think anything with basmati is fabulous! Yoy proved me right here! Mmm love this Mexican side dish creation. I finally found queso fresco at this little Mexican place! But didn’t get any as I wasn’t going to be home anytime soon. Yay for following your gut! This looks very flavourful. Dana!!! Tag this as mexican.. it’s always a hunt to find in the archives ;) Please! 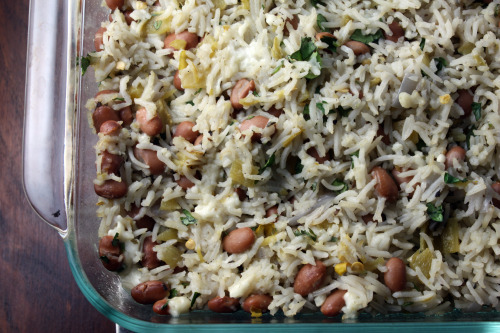 This Mexican side dish looks great! I make a similar version (with more beans and cheese) that I bake and serve as a dip. It doesn’t need a recipe either. Just taste and go. Re comment no. 16 by Patty on 10/23/11, a newsletter I received from WebMD 1/13/12 had a link to the incorrect recipe again (looks like the first four ingredients should have been omitted). I emailed them about it today and am also leaving a comment here so that maybe one way or the other it’ll be correct the next time around.